Iona and Peter Opie were a husband-and-wife team researching childhood folklore. They started their work in the 1940s, when the birth of their first child sparked off their interest in nursery rhymes, and over more than four decades, they extended their research into many other areas of children’s culture, including children’s language, customs and beliefs, play and games. The Opies published more than 20 books – anthologies of traditional nursery rhymes, songs and fairy tales, as well as observations and analysis of children’s play and games in the street and in the playground, and the lore and language of schoolchildren. The Opies were avid collectors, and over the decades amassed one of the world’s largest collections of children’s books and printed ephemara, covering children’s literature from the 16th to the 20th century. The Opie Collection of Children’s Literature – over 20,000 pieces – was donated to the Bodleian Library in 1988. But for their research in children’s culture the Opies not only relied on books published for children. They also wanted to collect the oral traditions of childhood – the rhymes, songs and games, the language and customs of the playground – and, quite a new approach at the time, they wanted to collect these from the children themselves. In November 1951, the Opies placed an advert in the Sunday Times, asking for help from teachers in collecting children’s lore and language, the idea being that schoolchildren answered a set of questions about counting out rhymes, local superstitions, cheers, slang and abbreviations, and send in the ‘suggestionaires’, as the Opies called their survey sheets, via their teachers. Over the years the method evolved into asking open questions, or encouraging the children to freely describe their games and playground activities, hobbies and preferences. The teachers were instructed not to direct or aid the children when writing these papers, and even to leave the spelling unchecked. 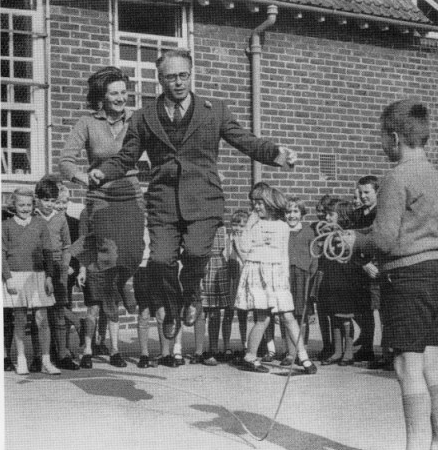 From the 1950s through to the 1990s, the Opies received thousands of replies from children from all over the UK, often with accompanying letters by the teachers describing the local playground culture from their perspective, and sending in school journals, photographs, newspaper clipping and other background information. With some of their correspondents, the Opies stayed in touch over years, allowing them to trace the development of games and playground crazes at a particular school or in a particular area over time. Box contents: Letters bundled by school – the Opies’ number referencing system in place. To process and analyse their data, the Opies developed a daily work routine: Iona Opie would sort and analyse the incoming information and compile working material, adding survey responses, secondary literature and bibliographical notes. Peter Opie would then write up the results in a first draft, on which Iona would comment on the basis of her data, and so on. This produced an ever-expanding system of sheet files – each one relating to a particular game or activity, with Iona’s rigorous approach to research data management (… this was long before databases and spreadsheets!) being crucial to keeping physical and intellectual control of the complex and extensive collection of research material. From the c. 300 Opie working files, or as Iona Opie commented: “we have no memories, we have only filing system”. The original children’s papers and teachers’ correspondence, along with the working files, form the core of the Opie Archive, which has been transferred from Iona and Peter Opie’s home and ‘research headquarters’ in West Liss, Hampshire, to the Bodleian Library in various tranches since the 1990s. 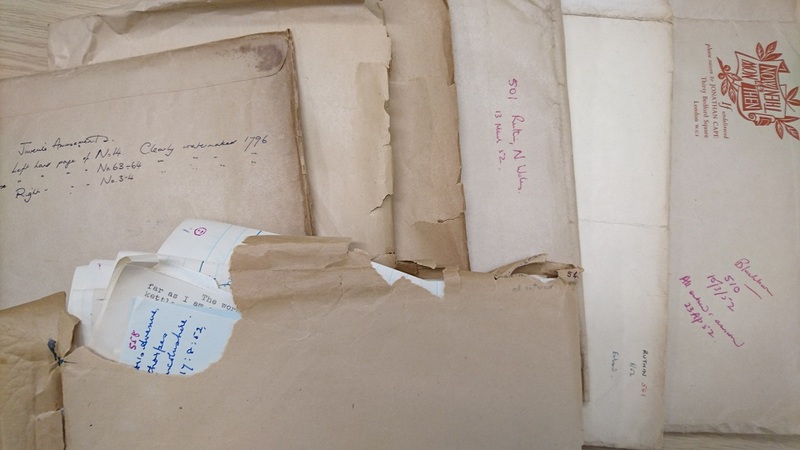 The archive – a total of 248 boxes – has been in use by researchers, but with only basic finding aids available it was difficult to navigate for anyone who did not know exactly what they were looking for. Whilst the children’s papers, working files and professional correspondence are still very well organised in the original Opie filing system, other parts of the archive – materials relating to the Opies’ publications such as drafts and notes for books, and an extensive series of personal papers and memorabilia, diaries and family correspondence – remain unsorted, uncatalogued and thus largely inaccessible to researchers. Some of the boxes containing Peter Mason Opie’s [P.M.O.] personal papers and correspondence, as well as the manuscript of his first autobiographical book ‘I Want to be a Success’, published in 1939. 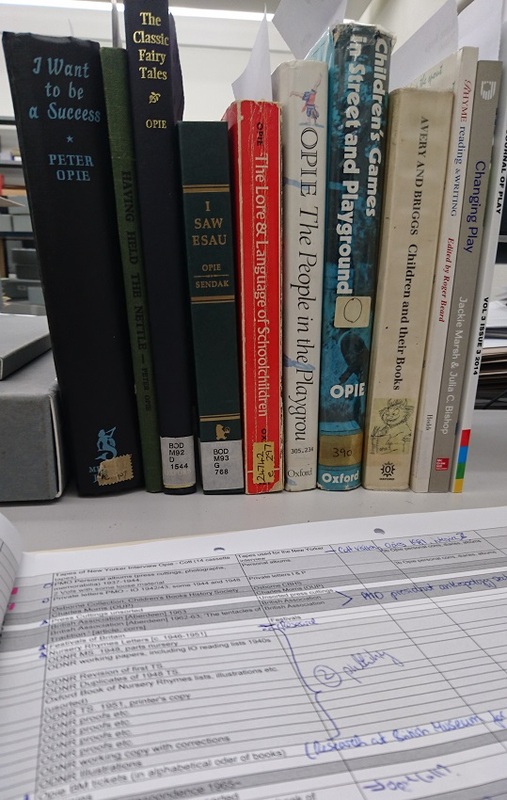 To open up the full research potential of the Opie Archive, a cataloguing project has started with the generous support of the Wellcome Trust. Over the next 16 months, we will sort and describe the archive to professional standards, consider questions of copyright and data protection, and address any conservation needs. We aim to release part-catalogues as work progresses through the series of the collection, with the final, complete catalogue becoming available in June 2018. The first weeks of the project have flown by with stock taking and project planning, working from existing lists to get an overview of the content and structure of the archive, assessing the physical status, thinking about the future arrangement of the collection, and developing a detailed working plan. Not least, there was a lot of background reading to do, to get an idea of the Opies’ lives and work, and provide the context of the archives material we are dealing with. 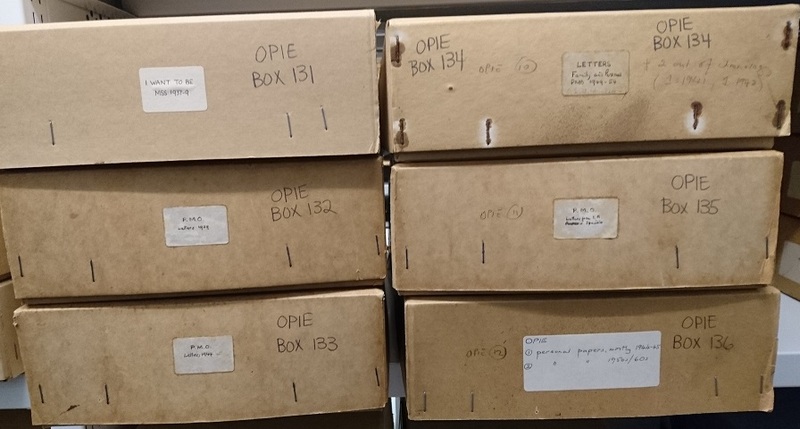 Please note that whilst we will try to accommodate urgent researchers’ requests for access wherever possible, sequences of the Opie Archive will become temporarily unavailable whilst preservation and cataloguing work is being carried out. If you need to consult material from the Opie Archive before June 2018, please contact us with as much advance notice as possible, so we can advise on the availability of the material in question and make the necessary arrangements. 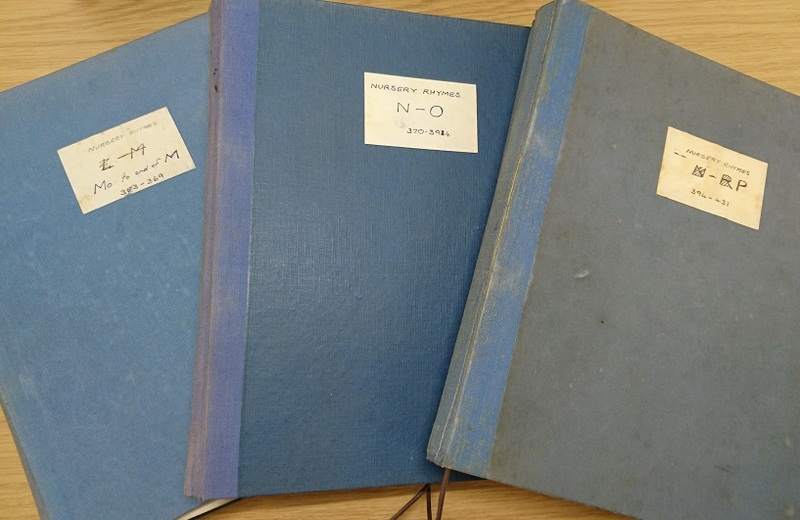 In the meantime, we will keep you updated with further blog posts on the progress of the cataloguing work, and make sure to share some stories from the Opies’ fascinating world of childhood games and nursery rhymes.